Item2013.6.36.1.002.027 - Store in Sardis, Chilliwack B.C. Item2013.6.36.1.002.028 - Old church or school being demolished in Vancouver, B.C. Item2013.6.36.1.002.029 - Home in Vancouver, B.C. Item2013.6.36.1.002.030 - Stone house in West Vancouver, B.C. Item2013.6.36.1.002.031 - Church at Clayburn, near Abbotsford, B.C. Item2013.6.36.1.002.034 - Buckingham Apartments in Vancouver, B.C. Item 2013.6.36.1.002.031 - Church at Clayburn, near Abbotsford, B.C. Church at Clayburn, near Abbotsford, B.C. 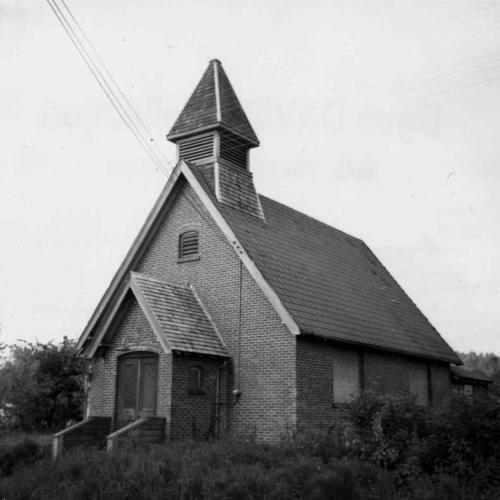 Photograph depicts an unused church at Clayburn, near Abbotsford, B.C. The church and about half the buildings in the village are made of brick.